Many many years ago I started playing darts for a tavern called Better Times. I was there often playing darts and even running weekly tournaments after dart league. One of the issues we all had was how to get dart supplies. At this time I just started ordering in bulk online and would sell to friends. This went on for quit a while until the owner asked me to set up a cabinet and sell them in his tavern. The owner even went as far as purchasing the cabinet for me that you see on the right hand of this page. 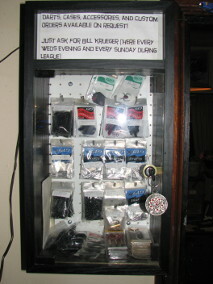 This small cabinet was the start of Bill's Dart Supplies. It was very limited in what it could hold and in my opinion was not made very well. Due to its size, it only held the very basic of items for darts. But this was the start of myself becoming a legitimate business. This cabinet served its purpose for many years until Better Times closed down. Shorty after this I was contacted by two different taverns. Gregs Tap and The Big Easy both wanted dart cabinets in their taverns. So I ordered two large cabinets as seen to the right. 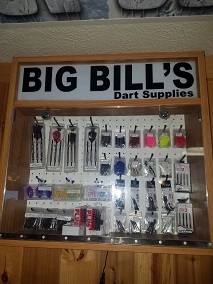 These new larger cabinets allowed me to sell many new items to the local dart players. I started taking the business much more seriously and started researching the products I would sell. Over the years I have tried out many many different styles of flights, tips, and shafts. I actually gave out samples and got feed back from many dart players. My main business goal has always been to sell quality supplies at an affordable price. I do not sell cheap items that do not last in my cabinets. I take pride in selling quality and it is something that am known for. Business kind of stayed the same for the next few years. I would sell to individuals and the few taverns and everything was going good. Then recently I had more and more taverns contact me. This was kind of a surprise because I've never actually went and sought out business. Word of mouth is how my business has spread. I've never sought out new taverns because I did not want to saturate the area. Taverns that have a strong core of dart shooters have contacted me and these are the places I love to do business with. With all the new business I decided to make my own cabinets. I made a few trial ones that I ended up not caring for and never used them. But each one got better in design, functioned better and used better materials. Now i make my own custom cabinets (as seen above) for taverns wanting my services. Today I have cabinets in two counties and six different towns. 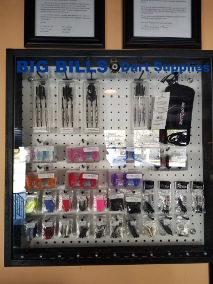 I have no idea where this business will lead in the future, but I know it will continue to grow with the darting community.